As most Korean fans already know, Super Star K is a talent show that is hosted annually to find the next superstar to sing for the Mnet Asian Music Award. 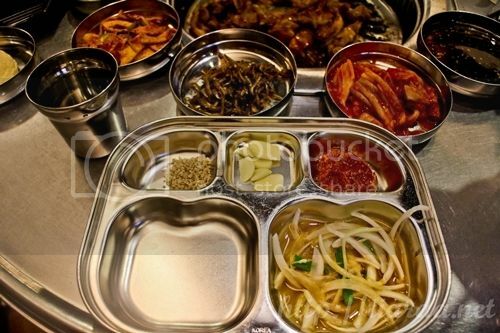 Similarly, Super Star K is one of the most highly-raved Korean restaurants in Singapore. 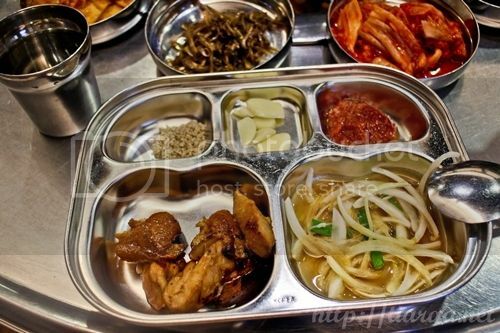 Since I was going to meet my younger cousin around Tanjong Pagar area, I decided to have Korean cuisine since I was craving for it. 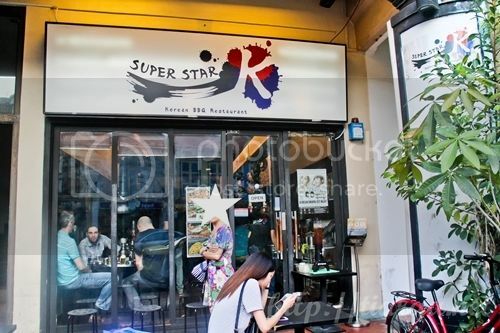 June showed me a review that stated that Super Star K is one of the top-notched Korean BBQ restaurants in Singapore. Reading how long people queue for it in the blog, I told her that we should not waste our time lining up for it. Fortunately, when I was waiting for June at Super Star K at 6:15pm, there was not much line up. All I had to do was to register my number and the number of pax dining in the computerized registration provided and I will receive a call once there are seats available for me. My phone was ringing just 2 minutes after. However, since June has not arrived yet, I could not enter the restaurant as they needed the entire party to be present in order to bring you to your table. While waiting outside though, there are seats and free flow of cold beverage available. When June arrived 15 minutes later, we could go into the restaurant, state our queue number (A2) and we were able to sit immediately. Do not expect comfortable chairs for this restaurant as there are many people waiting to dine. Thus, the stools function for you to just dine quickly and buzz off. That was exactly what we felt while chewing our food slowly. 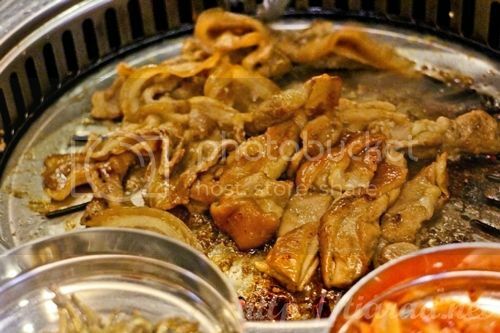 Let’s see.. We ordered 2 marinated meats namely Soy Chicken & Bulgogi for BBQ, a bowl of Kimchi Stew and one Seafood Pancake. 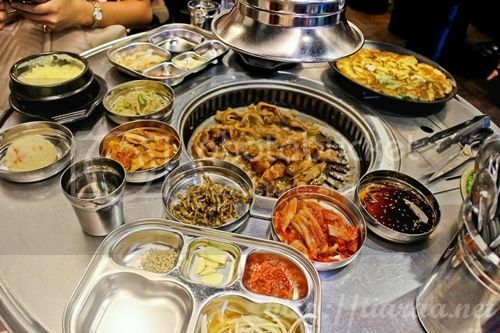 The dishes cost SGD$18, SGD$19, SGD$26 and SGD$13 respectively, which resulted in SGD$89.45 altogether, inclusive of 10% service charged and 7% GST. Without even finishing half of our dishes, our Chinese speaking server warned us sternly that there are many people waiting. Thus, we got to be quick. When we were still not done with our food half an hour later, the same server was making all sorts of sounds with the plates and utensils while clearing the table next to us and staring at us to remind us that we are taking far too long to finish our food. Her behavior was really atrocious and I found it very appalling. This restaurant is definitely not a good dining place for catch ups, long conversations and first dates. All the food except the marinated meats were not that fantastic either. 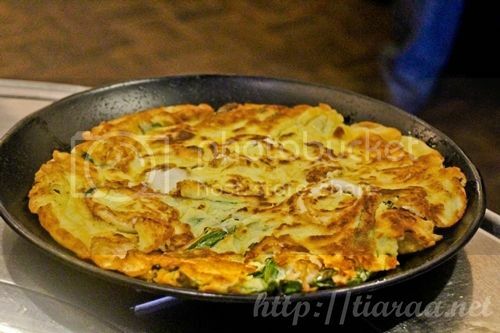 The seafood pancake was too starchy and the glass noodles were too thick. The broth of the kimchi stew was spicy but bearable. I have no idea why people are still waiting even at 8 pm or 9 pm but I seriously do not feel that it is worth the wait. Even if a restaurant is rated the best based on taste but has horrible customer service skills, I would not take the effort to visit it anymore. I find that even the long wait is not justifiable as well. Nothing seems to impress me dining at this restaurant. The servers got to brush up on their CS skills. Moreover, the price is relatively expensive for such terrible service and mediocre food.